Why call a “stir-fry” a “stir-fry” if it’s not a “stir-fry”? 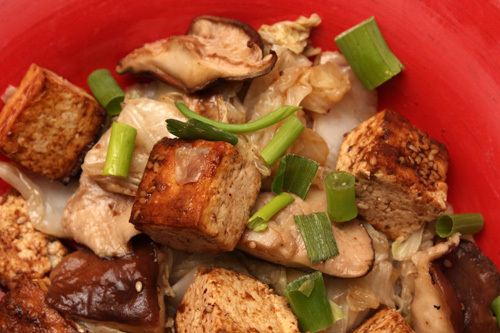 Certain expectations are attached to a “stir-fry.” The “Baked Tofu Stir-Fry With Cabbage & Shiitakes,” from the September/October 2014 issue of Eating Well, is indeed baked. The “stir-fry” part never happens, here, so let’s just let that go. Baked, baked, baked. The tofu, the vegetables, everything goes into the oven, on baking sheets. A cleaner, streamlined process, indeed, rather than a stove-top stir-fry. Smell that sesame oil while all of this bakes. It’s a favorite scent, for me. Lots of cabbage gets heaped onto the baking sheet, but it does deflate in the oven, so fear not. I did double the amount of black bean-garlic sauce, toasted sesame oil, and sesame oil for the sauce, because I’m indulgent, that way. Notice how Eating Well ignores the use of salt in this recipe. Did I miss it? Maybe not. I placated myself with the Sriracha. Tofu bakes into a spongier texture than a stir-fry would. But if you’re OK with that, then this is a fine, comfortable recipe. Efficient, streamlined. Feed your crowd with it and be happy. Next time, let’s stick with the same September/October 2014 issue of Eating Well, and make the “Almond Cookies.” Brutti-Buoni. “Ugly but good.” You know I love them. Come back to my site next week to enjoy them with me.